In this article, we'll show you how to recover deleted data on your own, so that you can save both time and money. Deleting files from SD card by accident can be frustrating. Don't be panic! There are ways, both DIY and paid services, to recover deleted files from SD card, USB drive, hard drive, virtual disk and more storage devices. Solutions discussed in this post are very easy to follow and the SD card recovery process is presented in a step-by-step manner. Want to get back lost files from memory card? Let's begin. 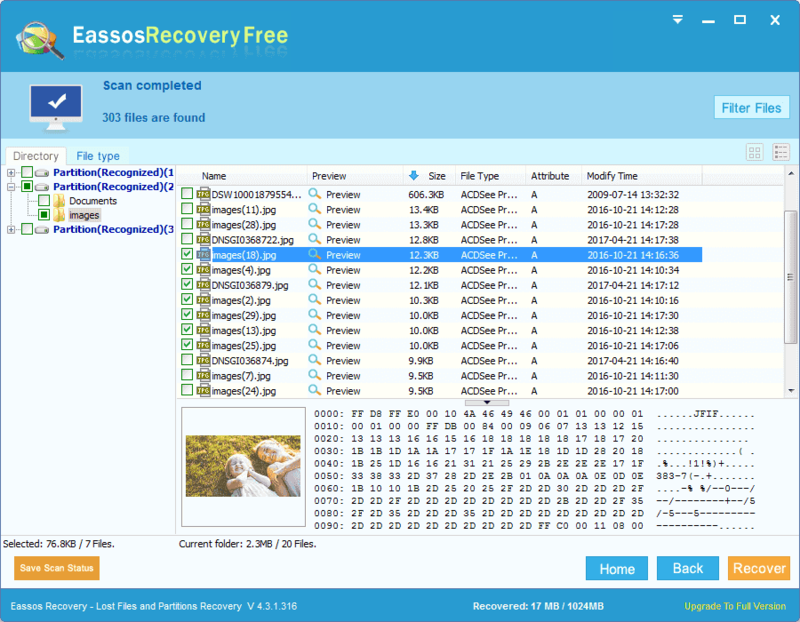 Method 1: How to recover deleted files from SD card via free software? How to increase the chance of successful SD card recovery? Have you ever thought that the tiny piece of plastic card could cause so many headaches? Data loss from SD card issue is very common nowadays and many of us have encountered it already. SD card, a kind of memory card, is widely used on all types on digital devices. It is small in size, but it provides large capacity to store various data. SD card seems to be a perfect storage device. However, serious issue may occur without warnings, leaving users in a mess. An example of such problem, is the loss of files such as photos and videos from the flash drive. Losing important data from storage device is a painful issue, but it cannot be avoid in many situations, as SD card may get damaged suddenly. Modern memory cards are designed with high speed bus mode to deal with files and complete functions. But in some cases, it cannot read stored data due to chip damage, firmware corruption, improper operation, etc. Besides, users may delete files from memory card by mistake or format SD card accidentally, etc. Fortunately, recovering lost files from memory cards and other storage media is possible and sometimes the recovery task is very easy. You should be aware that files lost due to formatting or deleting from such storage media are not wiped completely. Lost files will be kept on storage device in hidden for long time as long as they are not overwritten by new data. Saving data on SD card after deleting or formatting will overwrite binary space once occupied by lost data and then permanently erase lost data. Once lost file gets overwritten, they can never be recovered by any means. Factors that can cause data loss on SD card are just as many as the files you can store on memory card. In some situations, user's improper actions lead to data loss, but sometimes memory card itself errors also result in file loss. Below lists possible causes that you might lose access to SD card files. Accidental deletion: you accidentally delete photos other files from SD card before saving them to computer, for example, you may press the Delete button by mistake while viewing photos or video on the digital camera or smartphone. Improper operation to the device: some users continues taking photos even when the device is running out of battery or the memory card is lacking of space to store large data. In such cases, files on the card cannot be stored stably and finally goes to data loss situation. Formatting: SD card can be formatted either by digital device or computer. But luckily, most often the formatting is quick format and does not completely clear the SD card . Digital device gets damaged: the digital device that holds the SD card, such as camera, is dropped to floor or water. The damage is like to extend to memory card. Compatibility issue: it happens that SD card is not well compatible with the device, for example, its speed or file system does not meet the requirements on the device you want to use. You should make sure the SD card is qualified before inserting it to device. SD card quality: SD card with low quality tends to errors and brings about data loss issue. Thus, when you purchase any storage device, do not consider cheap off-brand device. Bad sectors: No storage device can escape bad sector issue, which seems like people get diseases. File stored on bad sectors cannot be accessed. SD card corruption: SD card become inaccessible and prompts error messages when you try to open it, such as " The parameter is incorrect " " The file or directory is corrupted and unreadable "
Physical damages: the memory card cannot be recognized by digital machine or computer, and it is likely to be physically damaged. For instance, firmware corruption or memory chip damage. There is more than one option available to restore deleted photos or files from SD card as well as USB drives. We can choose to either recover data with SD card recovery software or hire a data recovery service. Recovery software VS. service, what's the difference? No matter how your files get lost from your card such as deletion or SD card error, the correct recovery software is able to restore lost files for you. When a file is deleted from SD card, its binary data is left on the card and recovery software will scan the card and recognized such data and restore lost files. Besides, recovery software works on "card not formatted" errors by retrieving data from the card without doing damage to original data. When you recover deleted or lost files from memory card using recovery software, you should connect the SD card to your computer first, and then run the data recovery application you installed already. You can scan the SD card with the software, after which you'll be allowed to preview recoverable files and recover files to a secure location. The DIY SD card data recovery with software for deleted recovery is a good option and it is preferred by most users. But if the memory card is badly damaged and cannot be recognized by computer, you will have to consider the other option – card recovery service. Since recovery software cannot detect the memory card, and scanning or recovery is no longer possible. You can look for such services at local company or online shop. They can retrieve data from dead SD card as well as hard drive with the help of specialized machines. Once your data is recovered, they can transfer data to you via cloud storage or email. Such recovery process is complicated and time-consuming, and the price is often expensive, which charges depending on data loss situations. Most of such service follows a principle: no data, no charge. Moreover, many recovery centers provide free card checking service to help you predict possibilities of successful recovery. Therefore, you can contact some local or online shops and ask the prices, time and options, etc. First, power off the digital device and take out of the SD card. Do not plug memory card while the device is working. Second, check the appearance of the SD card in question to make sure it is not write-protected. Some memory card has a write protection switch on the side, and you need to turn off this switch. Besides, you should check if the SD card has physical damage, such as whether it has complete physical components. Third, prepare a card reader so that you can connect it to your computer. If the card can be read on your digital device but not in computer, you should try a different USB port, SD card reader or computer. Also, you can connect the digital device to computer via USB cord to see if the SD card can be detected by Windows. Last, download and install memory card recovery software, either freeware or paid software. You can prepare two or more such programs and use them to scan the SD card for deleted data one by one. Then you can compare the recovery result and choose the one works better. When it comes to SD card data recovery, the first option would be free memory card recovery software you can download online. Most free or open source software works well to recover deleted files, while paid software works better on complicated data loss situations, such as RAW drive, corrupt SD card, formatted device, etc. Recover deleted files: this recovery mode can be used to retrieve deleted files from SD card or files during cut & paste. 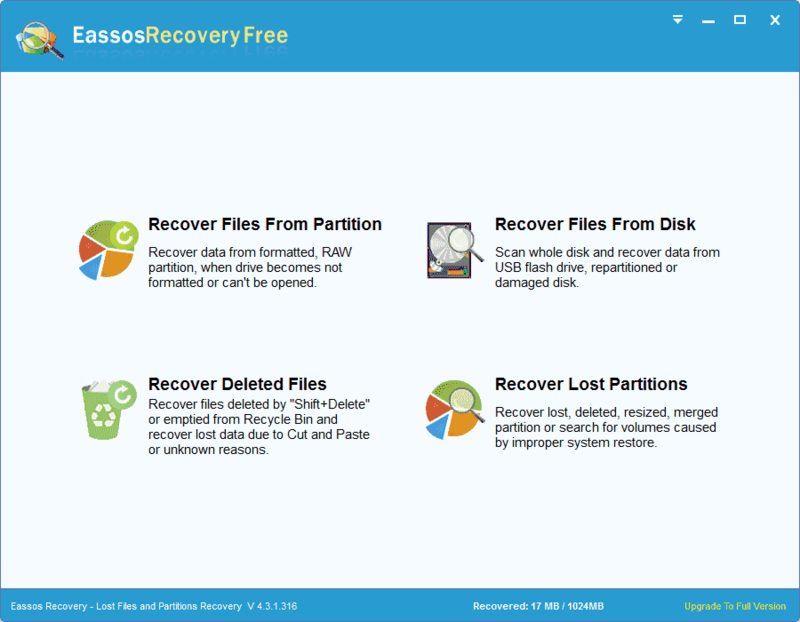 Recover lost partitions: it works on storage device whose partition is deleted or lost, and it's able to restore original volumes with files. Recover file from partition: this function is part of partition recovery, but it is specially designed to retrieve data from formatted, RAW and corrupted SD card partitions. 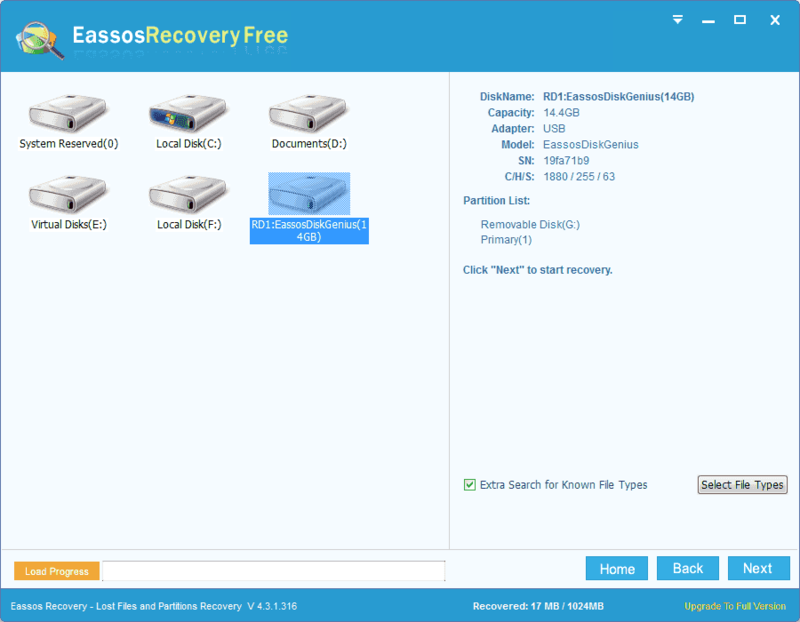 Recover files from disk: when USB flash drive or memory card gets damaged and cannot be recognized in Windows Explorer, you can try this feature to scan the device and recover lost data. Step 1 Launch Eassos Recovery Free and select recovery mode from the main interface. There are four recovery modes available and each deals with a series of data loss problems, for instance, if you want to retrieve files from RAW SD card, the "Recover Files From Partition" should be chosen. In this example, we're going to recover deleted SD card files, then "Recover Delete Files" is the correct mode. Step 2 Select SD card that needs recovering data and click "Next" to start scanning. Make sure the disk or partition you selected here is the one where deleted files were stored, as scanning wrong location cannot find our desired files. Step 3 Preview and select files you want to recover. You can either click "Preview" or double click a file to preview file's original content, so that you can judge if it is the one you want to restore. The select files you need and click Recover button. Step 4 Set a location on your computer and click OK to save recovered files. Note: recovered files shouldn't be copied to the SD card being recovered in case of data overwrite. Thus you can save files to your computer for the moment. Safely recover deleted photos, music, video, emails and documents from all kinds of storage media. Supported SD card types: SD card, SDHC card, XD card, MicroSD card, MMC card, Mini card, Compact Flash card, etc. Supported data loss situations: deletion, formatting, SD card failure, virus infection system crash, partition corruption, RAW disk, etc. No tech skills are required: users can retrieve lost data from memory card within simple steps. File preview is available: you can see all file before actual recovery and selectively recover files you need. Advanced file search algorithm: both quick and deep scan are carried out to track down load data, so that it can find as many recoverable files as possible. Support creating SD card image: if SD card is bad damaged, you can create a sector-level image file for the card and them retrieve data from card image. Step 1 Launch Eassos PartitionGuru Pro from your computer, right-click on the partition which needs recovering data and select "Recover Lost Files" from context menu. Step 2 Select recovery mode and click "Start" button to searching for lost data from selected volume. This article talks about recovering deleted files from memory card, thus we should select "Recover Deleted Files Only" option here; apart from that, it is recommended to select "Search for Known File Types" option which will perform a deep and advanced scanning in order to find more recoverable data. Once scanning complete, you can preview files listed by the software. Double-click a file and view file content in original size, and you can decide whether it is damaged. To get files recovered, you should copy and save files to a different location: select files and folders you need, right-click on them and choose "Copy to"; then you'll be asked to set a location to save these files. Though SD card recovery technology is powerful and able to deal with all kinds of data loss issue, but that does not mean you can successfully get back lost files all the time. There are a few things that can help you improve chances of successful recovery. Stop using the SD card at once. Once you realize data loss issue on SD card, stop using it right away. If you continue taking photos or saving data to the card, you'll overwrite and destroy recoverable files. If that happens, no recovery software or company can restore lost data completely. Create a full backup for SD card in time. Data backup is the best method to again data loss and all users should make a backup copy in time. If memory card is physically damaged, you can still try restoring data from backup. Do not format / reformat SD card. When partition on SD card corrupts, you cannot access the card and get error message asking to format it. If you format it, the recovery result will be affected, as formatting or reformatting overwrites original directory structure. Use reliable and safe recovery software. Make sure the recovery software you download is clean, free from virus as professional enough. Never try cracked recovery software which may contains virus and damages original data. 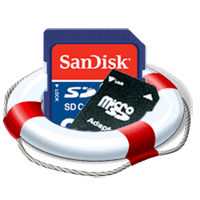 This page contains content on solutions to recover delete files from SD card with free & paid software. We hope this article has helped a bit on recovering lost data from memory card. If you need more help with the issue or encounter any problem during the recovery process, please feel free to contact us. Our support team would love to help.